Im thinking about buyn a steering wheel with a quick release adaptor and NRG makes two that i really like, and at a good price. 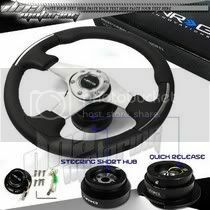 Has anyone had a NRG steering wheel and what they thought about it quality wise. oh and anyone that has opinions on these two steering wheels feel free to comment.